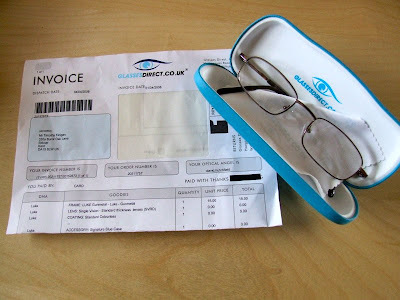 This packet arrived in the post last week, just a few days after I placed an order at glassesdirect.co.uk. I have now got to the point where I need reading glasses more and more so when I lost a pair somewhere in Helsinki airport, I decided to try out this website by buying the cheapest glasses they had to offer. 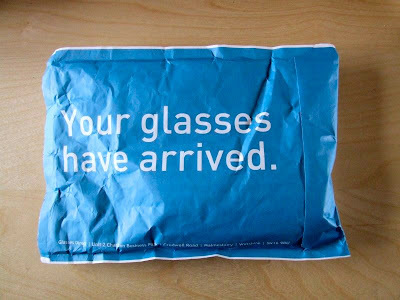 You type in the numbers from your prescription on an online form, pay by card and then the glasses come in the post. I am unaware of any shop that can beat a price of £15 for prescription glasses. If you want to pay more, you can get "fashion" frames, bendy glasses, have them coated, tinted or made as bifocals etc. A rather nice touch is that if you post about them you get a £5 off voucher. So that's my declaration of interest! I realise that this sounds almost like a piece of spam so I will stop there. It is just that many glasses wearers I have spoken to were unaware of this possibility so thought it would be helpful to post about it.